Tex-Mex Food - Tex-Mex is not native Mexican food or typical Southwestern Mexican food. It's identified by the American cheese component, or occasionally Velveeta or mild cheddar, none of which were typical in Mexico. Our favorite Mexican food restaurants vary from time to time, but if you're in Austin, you can't beat Maudie's (4 locations at last count) or for Tex-Mex that's really old-fashioned, try El Patio on Guadalupe, where you're served saltines as an appetizer instead of tostadas. Ninfa's has fantastic hot flour tortillas, but we like our Tex-Mex a little greasier and cheesier than most of their entrees. 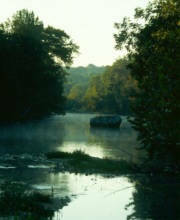 Garner State Park - Located on the Frio River, this has been a favorite of Texans for generations. Dancing on the pavilion every night, tubing down the river, climbing the "mountain" and exploring the caves, and just generally taking it easy surrounded by cypress and oaks and the occasional water moccasin. What could be better? Barbecue - Gee, where do we start? There's Kreuz's (pronounced "krites's") or Smitty's (our favorite) in Lockhart, Coopers in Llano (pronounced "lanno"), and Milt's BBQ in Kyle--although they serve that German style potato salad whereas I prefer the good ol' Miracle Whip with a little mustard style. Whether the bbq is with sauce or without sauce, as long as it's fall-apart tender and served with pickles and onions and cole slaw and (good) potato salad, we'll be happy. For Texas-sized ribs, you can't beat County Line in Austin. I like the Bee Caves location because of the view - although now that I think about it, the view is probably nothing but houses now; it's been a while since I've been there. The one on Bull Creek is also nice, in part because the kids can feed the fish and turtles from the pier. Piney Woods - Pine trees, red earth, critters... 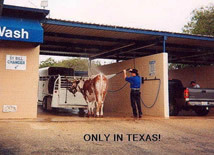 It's like another world, especially if you grew up in West Texas. Bob Bullock State History Museum - Great exhibits thoughtfully put together and great films and theatre experiences, all focusing on what's important to Texans, i.e. Texas. It's kind of neat that one of my early clients, Blue Genie, did the bas reliefs that adorn the front of the building. And I knew Bob Bullock because I was the secretary for the Travis County Democratic Party chairman when he and Bullock's first campaign for State Comptroller shared an office. (Ah, those brushes with celebrity are fun, aren't they?) Kids love the museum, and I am proud to have been a member of the museum since the year it opened. Austin - We used to like Austin more, back when it really was weird. You know a place is not weird when they have to make a concerted effort to tell people it is. When I was a mere child, there was "Bicycle Annie" who rode her bike all over Austin selling subscriptions to her non-existent publication. And there was the man who lived in Hemphill Park who read stories to all the children who happened by his house (and he wasn't even a pervert). A little later (late 60's), there was the converted bowling alley on 34th which was as close to Haight-Ashbury as you could get without being in California. We, like other young married couples, took our small children to see Bette Midler and Buffy St. Marie (my age is showing) and countless others at Armadillo World Headquarters (covering their ears to protect them as best we could). I happily participated in the Armadillo Oral History Project, when asked, by recounting my memories for their interviewer--or what memories I could recall. It's pretty true what they say - if you can remember, you weren't there. These days, the Austin "mystique" might be a tad more commercial than in the days of flower power, peace and love. But you can still hear great music and swim at Barton Springs or spin under the Christmas Tree or go skinny-dipping at Hippy Hollow (speaking of which... Hippy Hollow used to be for free spirits; now I suspect it's more of a free peepshow and not the simple au-naturale swimming spot it used to be). 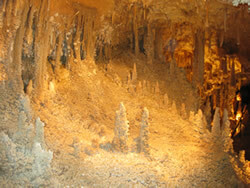 Caverns of Sonora - It's not Carlsbad Caverns, but it's an enchanting, smaller (much smaller) version of them. 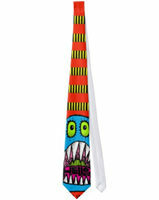 Check out the picture from our visit. Fort Worth Zoo - It used to be one of the best in Texas, but I haven't been recently so I can't say for sure if it's still great. That was where I first saw a Polar bear. Dallas Aquarium - Love this place! Wonderful tanks of saltwater aquariums that are specific to certain regions of the world. The little restaurant is affordable and very good. And there's a very realistic "rainforest" l obby sort of thing through which you walk to see everything and underneath the floor are "streams" running through with fish, alligators, etc. Very cool. 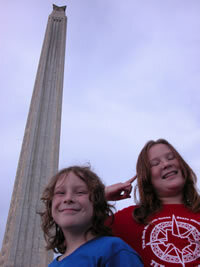 San Jacinto Monument & Battleship Texas - Ride the elevator to the top of the monument, but only if the weather is good. Not much to see when it's raining. The battleship has been restored and is as impressive and interesting as it was when I was 9. Wildlife - It's everywhere unless you're in the heart of a metro area like Dallas. Deer, horses, cattle of every breed you can imagine, jackrabbits, foxes, owls, painted buntings, coyotes... 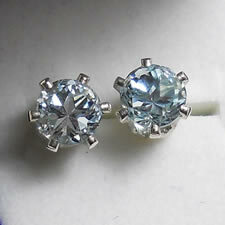 I love it! 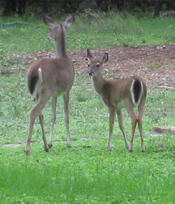 The deer shown on the right were shot (with a camera) near Blue Hole in Wimberley. I see cows in fields any time I leave our neighborhood. The other night I heard coyotes yipping. Yee-ha! The list goes on.... Big Bend, Palo Duro Canyon, the Medina River near Bandera, Del Rio for (long) day trips - but don't cross the border these days, the Alamo, Barton Springs, Possum Kingdom Lake for fishing, ditto for most other lakes, anywhere in the Texas, the MacDonald Observatory in Fort Davis, the Stockyards in Fort Worth, etc. In Tarpley, you have to try Mac and Ernies for gourmet food out of a portable building and eaten on a picnic table (bummer...after many years, they have finally moved out of the portable building and into the empty restaurant across the street. Food is still wonderful, but the atmosphere is lost. Regardless, I'm so hungry! And, of course, I love it when I see a school helping young Texans appreciate their heritage. 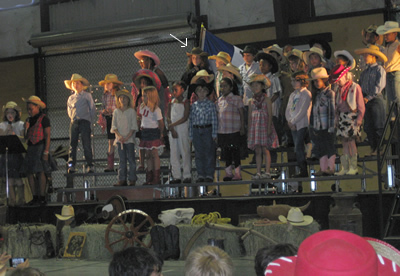 My long-haired grandson is up there on the back row, singing C&W songs with his class. People wearing shorts and tee-shirts when going out for dinner (except in Dallas). Don't like the weather? Wait 20 minutes or drive 20 miles.